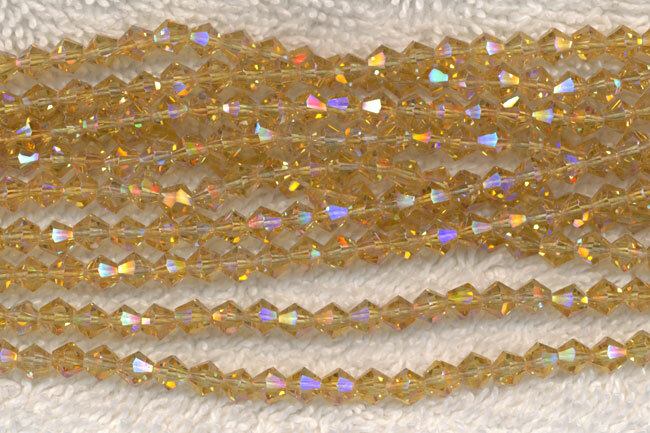 CLEARANCE 4mm Yellow Citrine AB Bicone Crystal beads for jewelry making. These faceted Chinese Angelic Crystal glass beads are sold by strand containing 120 beads. Compare to Swarovski Crystal Bicones Style 5301. 4mm Crystal bicone beads are a popular size choice for bead stringing, and making beaded jewelry & accessories. These crystal beads will lend breathtaking sparkle to any of your jewelry creations - 3 strands min..